Appartement rénové au dernier étage du bel immeuble du patrimoine, en plein cœur de Saint- John. À travers la route, vous trouverez le Sheraton Hôtel & Spa. Sur le même bloc, un café local et traîner. De nombreux restaurants et bars à distance de marche. Tous les appareils et l'équipement que vous aurez besoin, y compris les ustensiles de cuisine, serviettes, linge sèche-linge, etc. Permis de stationnement pour une voiture. câble gratuit et un accès Internet. Vues sur le port et le centre-ville coloré. 4 pièces salle de bain avec puits de lumière au-dessus de la douche. I cannot say enough positive things about this rental. It was clean, well maintained and incredibly comfortable. We had plenty of space and all the ameneties and little odds and ends we might need. The location was excellent -- easy walking to all of St. John's. Best of all, however, were the hosts. They were both friendly, gracious and full of answers and information. They truly made you feel like a house guest coming for a visit. My Mom and I stayed two nights in the top floor apartment, and are returning for a third night at the end of our trip. I have to say, I have never seen any host put as much effort into making you feel as home as Tasha and Glenn do! The apartment is incredibly well equipped, Tasha and Glenn couldn't be nicer and they were wonderful communicators. Don't give this place a miss if you're in St John's - you will want for nothing! It's located seconds from Duckworth and Water Streets - we hiked to the top of Signal Hill and walked to Quidi Vidi. Location is fantastic. Five stars from us! We really liked the location, size and layout of the apartment and found everything was provided by our friendly hosts including some awesome baking. Since it is in downtown we walked everywhere and we were only sorry, we could not stay longer, because there were so many restaurants we hadn't tried yet. The vegan Chinese place was a big success even for my meat loving son. We managed to do quite a lot of sightseeing in the short time and Greg was so nice to let us leave our luggage for a bit of extra time. Overall we would recommend this apartment. I am all about 'location' & this was prefect. The apartment was very comfortable and had everything we needed during our stay in St. Johns. After exploring the city it was nice to come back to relax and have more space rather then hotel accomadation. The owner was nice & met us upon arrival. The balcony offered a nice view as well as a place to enjoy the fresh air. The washer/came in handy. The apartment was clean comfortable with modern decor throughout. It made our stay in St Johns enjoyable. I was very happy & glad to have stayed at this vacation rental. My friends and I stayed here during our stay in St John's for a wedding, which also happened to be during the George Street Festival. The location is perfect! You are right downtown so there's plenty to do and a variety of restaurants, all in walking distance. If hiking is your thing the walk to and up Signal Hill is beautiful. The place was very clean and we were provided everything we could possibly need. It’s definitely a cute trendy apartment! Tasha and Glenn were great hosts. They were both very easy to reach before and during our stay. They were very accommodating of our schedule and let us leave our bags at the property while they made it ready (since we arrived fairly early). The other tenants in the building were also very friendly and gave us great recommendations on places to eat. Thanks again for the amazing stay, Tasha and Glenn! P.S. the biscuits were delicious! Glad you guys had such a great time in St John's. I was lovely to met you all. Hope to see you next time you come this way. Our stay was absolutely perfect! We were greeted by our host after arriving from a long flight from Houston, TX and enjoyed learning about all that St. John's has to offer. Glenn and Tasha were incredible - leaving little snack cakes, plenty of toiletries and making sure anything we needed was taken care of. 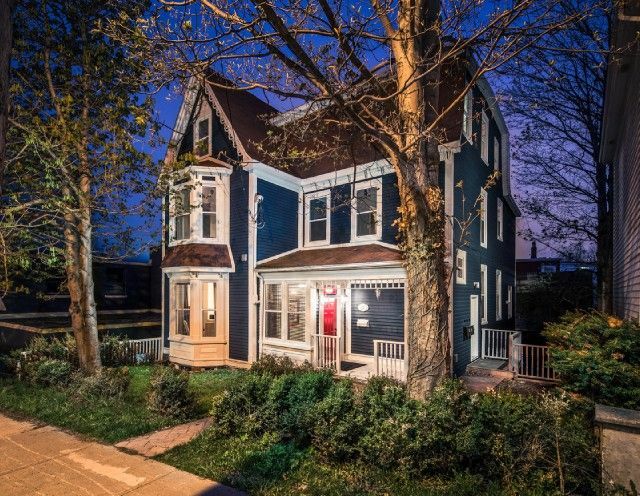 The location is prime - walking distance to everything in St. John's. We stayed in the upper floor apartment, so had a great view of the harbor and enjoyed drinking coffee out on the deck. It was also nice that they provided a parking pass to park on the busy street. We hope to be back one day! I recommend staying here if you are looking for great hosts, location, and a clean and well decorated place to stay! So glad you and your dad had a great time in St. John's before travelling across the island. Great to meet you both and would love to see you next time. Le plus jeune province du Canada avec la plus vieille rue en Amérique du Nord. St-Jean offre un monde d'aventure et a été l'accueil des personnes au port de partout dans le monde depuis plus de 400 ans. De nombreux événements culturels et des festivals locaux. Marchez jusqu'à la colline de signal historique, flâner dans les rues colorées et profiter des nombreux restaurants et bars, dont le tristement célèbre George Street. Participer à une journée sur la pêche en eau, visiter les nombreuses criques et anses, observation des baleines ou la visualisation de la trajectoire des icebergs.